The official 2018 Maine Lobster Boat Races Schedule has been released. Below are the dates of each lobster boat race of 2018, along with details of the best viewing locations and information on the harbors in which the races take place. Each boat race starts at 10am unless otherwise noted. Enjoy! June 16th – Boothbay Harbor Lobster Boat Races. These races are best viewed via boat. June 17th– Rockland Lobster Boat Races. These races are best viewed via Rockland Breakwater. The Rockland Lobster Boat Races have good prizes and draw a nice crowd of local boys and big boats from the surrounding islands. The Rockland Lobster Boat race festivities kick off the night before the competition, with a Dock Party at Journey’s End Marina. The party features a live band, cash bar and dancing inside the boat shed and outside on the wharf overlooking Rockland Harbor (from 6-10:30pm). The party atmosphere continues the day of the races, with lots of rafting up and partying on the boats while the races take place. 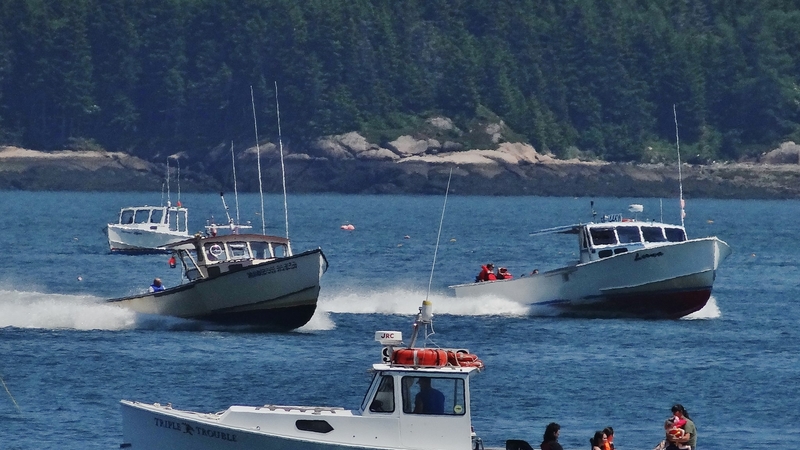 June 24th– Bass Harbor Lobster Boat Races. These races are best viewed via boat. A blessing of the fleet takes place after the races. June 30th – Moosabec Reach Lobster Boat Races (Jonesport Beals). These races are best viewed from the Beals Island bridge. This is perhaps the most iconic race of the season as Maine lobster boat racing as we know it originated in these sheltered waters between Jonesport and Beals Island. The races are always highly competitive and the towns host 4th of July events alongside the racing. The iconic arching bridge which connects Jonesport to Beals Island is an excellent vantage point for watching the boat races (as well as the official finish line of the race).. For a look at last year’s Jonesport Beals / Moosabec Summerfest 4th of July schedule, click here. July 8th – Stonington Lobster Boat Races. This is a fantastic race to attend, with a number of events happening before and after the main competition, including a pancake breakfast is held the morning of the races and crab meat rolls are served in the odd fellows hall after (you haven’t lived until you’ve had a Stonington crab meat roll)! The Stonington lobster boat races are best viewed by boat and Isle au Haut Boat Services runs a charter for flatlanders who want to view the action on the water (for further details email [email protected]). For those coming to compete, there is a public access boat ramp at Colwell’s next to the Isle au Haut Ferry and Mailboat wharf and the VHF Channel to tune into is 10. Stonington is one of the most picturesque lobster fishing villages in Maine and well worth a visit even if you can’t make it to the races. Bagaduce Lunch, in Brooksville, is a great lobster shack to check out if you’re in the area. To read about Stonington’s Annual Fishermens Day, which takes place the week after the Stonington boat races, click here. July 22nd – Friendship Lobster Boat Races. These races are best viewed via boat. July 29th – Harpswell Lobster Boat Races. These races are best viewed via boat. If you are driving to Harpswell for the races, it’s worth stopping into Estes Lobster House, which consistently gets listed as one of the best lobster shacks in Maine. August 4th – Kennebec Reach Lobster Boat Races. This is a new addition to the 2018 lobster boat races schedule. August 11th – Winter Harbor Lobster Boat Races. These races are best viewed via boat. The lobster boat races form part of a wider Downeast Maine Lobster Festival held in the town that day. The festival itself is well worth a visit and includes a pancake breakfast, parade and lobster dinner. For a look at the typical schedule for the Downeast/Winter Harbor Lobster Festival, click here. August 12th – Pemaquid Lobster Boat Races (Bristol). These races are best viewed from the top of the tower at Pemaquid Colonial Park. Olde Bristol Days are also celebrated over the weekend, with fireworks on Saturday eve, a parade, food, craft vendors, music and more. August 18th – Long Island Lobster Boat Races. Note, the Long Island Lobster Boat Races start at 1pm and is best viewed by boat. August 19th – Portland Lobster Boat Races (MS Harborfest). These races are best viewed from Fort Allen Park/the Eastern Promenade (including the walk-way below). These races form part of the annual MS Harborfest, which also includes a benefit auction, Regatta and Tugboat muster. Any oyster shucking contests, I Maine this year??? My pleasure. Last year, if I recall correctly, the final, official schedule was not published until April which is quite late. As soon as this year’s schedule is final I’ll update the page. That said, the Winter Harbor and Harpswell lobster boat race dates are already fixed for 2019 and The Moosabec Reach races will most likely be on the 29th so a schedule of sorts is starting to take shape. Hope you and your company enjoy the races and the summer season.